Our roll-in proofers work fast and efficiently, yielding even proofing with full loads or partial loads. LBC proofers are built with durable components and reliable, easy-to-use controls. 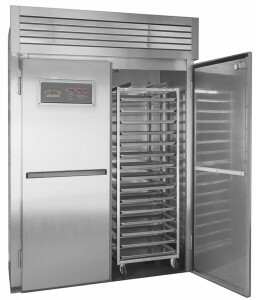 Proofers improve productivity and quality in baking breads. LBC proofers make the process of proofing easy and consistent, keeping uniform temperatures throughout the racks and even constant airflow. LBC proofers are available in single door, double door and triple wide models in depths starting from 30″ all the way up to 120″ deep. All models assemble using a cam-lock design, minimizing installation time. Our climate control system is fast responding and circulates air throughout the proofer for best results. The available water treatment system can handle most water conditions and reduce maintenance costs for years. Cartridges last an average of 6 months before needing to be changed. No matter what you space and proofing needs, we probably have the proofer you want. Depths from 30 inches to 120 inches. Stainless steel walls are injected with high-strength foam. Panels connect together with high-strength cam-type stainless steel locks. Roof panels screw to the top of the wall system with lag screws. Walls and doors are protected by polyethylene bumpers. Full-flow fan keeps a high volume of air flowing to minimize hot spots and keep the climatizer cool. Available water treatment system that can successfully treat most water conditions for up to 6 months. Unique sensor fan system keeps proofer air moving across the sensor all the time to keep it clean and accurate. Single wide doors open left or right, field selectable. Our line of roll-in proofers are constructed using two inch thick stainless steel wall and ceiling panels that are foam injected along with the door to ensure that your energy dollars stay inside the box. All models are equipped with heavy-duty welded stainless steel door hinges, to prevent door sagging and assemble using a cam-lock design, minimizing installation time. Our air-wash “Climatizer” system does not use emersion elements or a boiling pot, so there’s no need for float switches and no guess work when it comes to humidity levels. Convenient Controls The PID (Proportional-Integral-Derivative) Controls provide a gentle heat and humidity curve preventing over-shoot so you’re not pouring water down the drain. The control is mounted conveniently in the door at eye level and has large LED displays for time, temperature and humidity so your operators can keep track of every step of the proofing operation. What size of proofers are available? Proofers are supplied in four widths and multiple depths in 20 inch increments. The width of proofers are 38.5″, 58.4″, 75.5″, 102.5″. Can I get a pass-thru proofer? Yes, most any size proofer or retarder can be configured as a pass-thru. Contact your sales representative to discuss sizes and capacities. Does the proofer need to be vented? Proofers and Retarder/Proofers do not need to be vented and do not need hoods. Can a proofer be installed on a wood floor? The proofer can be installed on a wood floor, but due to water condensation, a wood floor is not recommended. Can I get a proofer with a Stainless Steel floor? Yes, most models have an optinal floors. What is the difference between a proofer and a retarder/proofer? Proofers provide an environment that is heated and humidified for promotion of fermentation. Retarder/Proofers also provide heat and humidity for fermentation, but also provide cooling to slow down fermentation. Retarder/proofers cool and then heat alternately and can be programmed to transition from cooling to heating. What utilities are needed for my proofer? What kind of filter do I need on my proofer? Water treeatment requirements vary from one area to another. The primary objective is to keep Chlorine levels low and to insure that minerals will not form deposits on heating elements, sensors and stainless steel components. This can be accomplished in most cases with a Carbon Block filter and Lime Scale inhimbitor, availabel from LBC. Some areas require alternate methods of water treatment. What if my water is softened? Softened water is not recommended, since softening involves the injection of high levels of salts into the water. Salts are Chlorides that can deteriorate both stainless Steel components and the water lines supplying water to the proofer. Does a rppfer include installation, start-up and training? Installation, Start-up and Training are not included with the proofer or retarder/proofer. They can be purchased at the time of purchase of the equipment, or an authorized installer can be contracted by you to install the appliance. For more information about Installaiton, Start-up and Training, contact LBC Service Department. Is the refrigeration system in the Retarder precharged or does it require a refrigeration mechanic? Most retarders are shipped precharged with R404A refrigerant. In some cases, the size of the components is too large to precharge and a mechanic is required to complete installation and charging. Models that are shipped pre-charged are LRPR1 ALL, LRPR2N-30 thru 90, LRPR2S-30 thru 90, LRPR3-30 thru 70. How LBC Proofers and Retarder/Proofer ship? All LBC Proofers and Retarder/Proofers ship in crates for assembly on site. Crates can all pass through standard 3′ doorways. Call LBC sales for weights and dimensions. Are LBC Proofers and Retarder/Proofers UL listed? All LBC proofers and retarder/proofers are listed by ETL Intertek (Edision Testing Laboratories) and are tested and approved to UL197, ANSI Z83.11, NSF Standard 2 and equivalent Canadian Standards. ETL is recognized by all building officials in the US and Canada. Need help picking a model? Consult our rack sizing guide to select a model that best suits your particular operation.